Abby had just stepped off the 7th floor hospital elevator when she spotted a young boy being pulled in a little red wagon. He neither turned his head, lifted his arms to her, nor spoke. She slowly walked over to him and began to lick his feet. The boy's face broke into a smile. This scene took place in a physical rehabilitation facility where Abby worked as a therapy dog, and was her initial introduction to Kevin, a young boy who had been in a car accident that resulted in his inability to speak or move. The physical therapist moved Kevin's hand to make patting and rubbing motions on Abby's warm fur. The only response Kevin could give was a beautiful smile. That was good enough for Abby. She stayed in the hallway with her new friend, visiting for another fifteen minutes before she had to go, but she promised she would see him later in his room. After she finished her regular rounds, Abby found Kevin's room, where she met his grandmother and father. After seeing Kevin's big smile, his father promised him that he could get an "Abby puppy", if only he would get well. Everyone in the room knew that this would probably take a very long time. Kevin was quickly added to Abby's patient list, and was scheduled for visits every two weeks. One day, she arrived at his side with a stuffed "Abby puppy" in her mouth, which was to be his very own puppy while he was in the hospital. She also brought lots of Abby stickers to place on the plastic side guards on his bed. Now she could be with Kevin all the time, even when she was visiting other patients or other facilities, or when she had to go back to her own home. Gradually Kevin improved, and after a few months was able to reach out ever so slowly, and touch Abby gently with one hand. He still could barely move and wasn't able to speak, but his smile let her know how much he loved her. She would put her head in his lap when he was propped up in his wagon. Everyone could see that Abby and Kevin were happy together, and had become quite an item. Finally one day, a long-awaited miracle happened. The hospital called Kevin's family to tell them that he had spoken his first word, his first word in five months. A nurse had gone into his room, and saw him holding his Abby puppy and studying the Abby stickers surrounding him. She asked him if he liked dogs, and he nodded yes. Then she asked him what his dog's name was, and to her amazement, Kevin spoke. "Abby," he said. Abby went to see Kevin the very next day, and upon entering his room, discovered his grandmother, waiting to show her another surprise. When Kevin was placed in his wagon, he came close to her, touched her ever so gently, and said, "Abby, I love you." Abby responded in the best way she knew. She licked his arms and hands, covering him with kisses and saying "I love you too." Abby continued to visit Kevin for several more months,while he continued to get stronger. When it was time for him to leave the hospital, he could move one of his arms well, and speak much more clearly. The hospital staff gave him a special party, which included a cake topped with Abby's picture. After Kevin's grandmother took lots of snapshots of the pair, Abby went to say goodbye for the last time. She washed kisses all over Kevin's face, arms, and legs. There was no doubt to anyone who witnessed these two together that Abby and Kevin shared a special bond that superseded all others, the bond of unconditional love. Abby's jobs included eight nursing homes each month, a public library 2 - 3 times a month, and various churches, schools, etc. upon request. She achieved the title of Therapy Dog International Exceptional Volunteer (TDIEVA), which is awarded after 350 therapy visits and is the highest title given by Therapy Dogs International. Abby completed 472 therapy visits. When I first got Alex from Stephen and Leah Napotnik of Greiner Hall, I was managing a bar. That's where he was socialized, starting right away as a brand, new puppy. Needless to say, after that, no noise or weird-looking people ever fazed him! He has been doing therapy work unofficially since he was 8 weeks old at the bar. You wouldn't believe the number of people I used to catch on the floor hugging him and whispering to him. When he started his official therapy work four years ago, he was visiting nursing homes and such; but I believe that what he does now, which is working as a canine aide to speech pathologists, is much more rewarding to him. Alex works with children in the Speech Pathology Dept. of Tulsa University, the Mary K. Chapman Center. The lady in the picture above is Dr. Beth McCauley, the head of the dept. 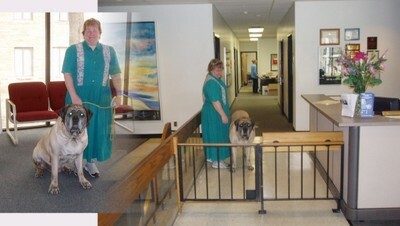 The other picture shows Alex in the lobby of the center with his owner, Kelly Carter. His workday begins once he is behind the gate. Starting as a once-a-week commitment, Alex now works 5 days a week because he is so good at what he does, and the clinicians are always asking for him. Most of the kids know him by name. With his heavy work schedule, he now has a Faculty Staff ID from TU, and even met the President of the University recently. The TU President’s Chef cooked him some treats made especially for their newest faculty member;-). His service in the Speech Pathology Dept. has been so substantial that there are universities and schools in the area (including MO and AR) that are considering starting this same kind of program. When Alex is working, it is not uncommon for parents of his patients to literally be in tears. There was one particular little girl that kept saying "Beeeg. Beeeg." Although it was adorable at the time, the child's mother had tears streaming down her face and was deeply moved. We later learned that up until that very moment, the little girl had never before spoken at all, not one single word. When Alex goes to work, he is paired up with a single clinician, and I know that they are constantly arguing over who gets to use him with their clients. One of his favorite patients is a 9 year old girl. I'm not sure what type of problems she has (maybe cerebral palsy), but they are severe. She has very limited use of her arms and hands. And yet, all a person has to do is say Alex's name to her, and she throws back her head, and laughs with joy. Alex is a great help to the children at the Mary K. Chapman Center, and he absolutely loves his work!! He provides a wonderful service, and is very much appreciated by all whose lives he touches. To read more about Alex and his work, click here. This is the story of “Boomer”, who died saving the life of his owner’s girlfriend. Because his heroism so moved me, I began collecting stories about extraordinary mastiffs; and it is in his memory "A Good Look at Mastiffs" is dedicated. Boomer, this one's for you. Boomer stepped right in with the sensitivity and understanding unique to this magnificent breed of dog. Our mutual respect and love for each other grew deeper every day. Boomer was there for me every moment of the next two years on a day-in and day-out basis. I've NEVER had a better friend than Boomer. His untimely death from smoke inhalation, when he was saving the life of my lady friend, Marie, when my home caught fire, devastated me and left me feeling empty. Boomer, I know you are in a good place, and I think about you every day, and I miss you terribly. I was dog sitting with Boomer while Ken was away and I slept upstairs, while Boomer slept downstairs in the dining room. Occasionally, he would come up to the top of the stairs in the morning and wait, not disturbing anyone, unless they overslept. This particular morning, I got out of bed and headed for the shower. I had the water running and one foot in the shower, when Boomer came into the bathroom. He whined and whined at me, not leaving me alone until I followed him. When I got to the head of the stairs, I heard a "crinkly" noise, and as I looked up, I saw the whole ceiling erupt into a shower of sparks and flames. Everything was filling up with smoke, and Boomer headed downstairs, I think to lead me to safety. But it was too smoky for me to find my way to the door. I dove back into the bathroom where I had a cordless phone, and dialed 911. I stuffed a robe under the door and a wet rag over my face, and it seemed like they were there almost instantly. The last thing I remember before I passed out was hearing the fire department saying that they were there. I spent two months in the hospital with smoke inhalation injuries, followed by pneumonia and other complications that involved 5 surgeries. I'm on the road to recovery now, but I do know that without Boomer, I wouldn't be here, able to write this letter. I don't know how dogs sense danger, but I do know that Boomer gave his life to save mine because if he hadn't gotten me out of the shower, I wouldn't be here either. Boomer, you will always be my "Guardian Angel". I have no right to add to what they have said, but I wanted to because Jim and I have produced champions, and have ranked our dogs nationally. But the truly bright star on our tree is Boomer, and what he accomplished. So for those people who think that being a Champion of Record is the best thing their pups can do, personally we feel Boomer wins hands down. We miss him too.... 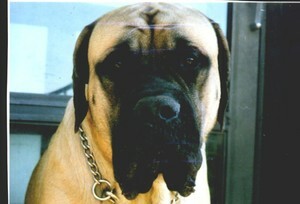 Please hug your mastiffs in his memory. 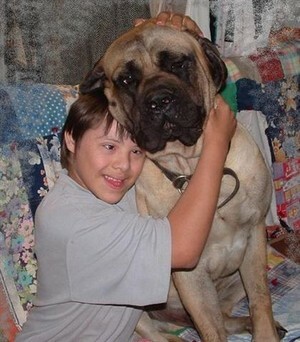 My son has Down Syndrome, and my dogs - his dogs - are a big part of his happiness and self-confidence. Trever has a very limited vocabulary, and among the few words he can say are the names of his dogs. He also finds unique ways of communicating with them; for instance, he claps quickly and lightly 3 or 4 times, and Darius, Kara, and Ziza have learned that he is saying "come". The neat thing is, this is something Trever and the dogs figured out all by themselves—I had no part in training them or even coming up with the idea. 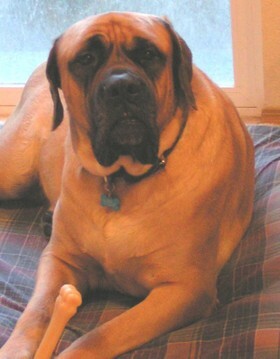 I had filled out an application to work for mastiff rescue and after a few months, they called to inform me that they had received a call from a local shelter that a mastiff was there. All they knew was that he was an 18-month old brindle and he had been left tied to the shelter's fence in the middle of the night. Eventually they learned that his owner was a drug dealer fearing an arrest. He tied the dog to the fence because he had made him so barrier-aggressive that he knew if the police came, they would have had to shoot the dog. Even so, the shelter manager was able to talk down the mastiff and mastiff rescue reassured me that he was actually good-natured, just not trained. And not neutered. And he had probably never been in a car before because the hour-long trip home was most interesting, since he was determined to either drive or squeeze himself into the front seat of my Honda Civic. After a year of intense training, behavioral counseling, obedience classes, copious hours of walking and dog-park socialization, I am proud to say Dozer passed his therapy dog test and began visiting a retirement home in Toronto. Not long after that, he tested with children because he is great at doing nothing, which is a good thing, and was pegged as a therapy dog aide for a children's reading program. As it turned out, he has become a regular visitor in a special school for disabled children and has been a great success. In every way he has become the sweet, warm, cuddly goofus he was meant to be, and we love him dearly. Draco has awards and accomplishments too numerous to mention here , so I’ll do a small recap. He has been a therapy dog with head injury and paralysis patients, a demo dog for a variety of canine education programs, a meet-and-greet dog, a reading partner program dog, and a general all-around canine good citizen. 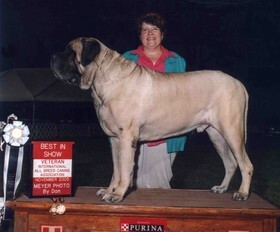 He has been honored by the Mastiff Club of America, as well as the American Kennel Club, and has done an incredible job of bridging the gap between dogs and people in terms of education and service. Even with all Draco’s accomplishments and years of service, the most important thing to me is that he is my friend and is always there for me. Especially in one very critical moment. I was working nights as an RN at VA Medical Center in St. Louis. It was around 6pm and I was in bed trying to sleep before my shift. All of a sudden, I had the sensation of vertigo―but I was the one spinning, not the room! It just came upon me. I found that I could not get out of bed and had no control over my movement. Draco was right there at my bedside, waiting for me to grab his collar. At the time, I did not have a phone in my room, so he pulled me by dragging me across the floor to the living room where the phone was. He even got the phone for me! I was able to call 911 to get an ambulance to my house. He then pulled me to the door, so that I could open it for the EMT’s when they arrived. He never barked or even challenged the paramedics/police officers when they came into my house with all their equipment, and any mastiff owner knows how protective they can be of their house and owner. I was diagnosed with a rare inner ear infection that comes on fast and hard. The police officers and paramedics were so impressed with him that they came by my house after my discharge from the hospital, to give him treats and to see how I was doing. Another time, he did a wonderful down/stay for me when my mother passed out from loss of blood from a nose-bleed (she is on a blood thinner), which gave me time to elevate her legs until the paramedics arrived to take her to the hospital! I am very blessed to be owned and loved by him. Fluffy’s story has been published in 1999’s MCOA Journal no. 04, as well as the January, 2001 issue of the AKC GAZETTE. 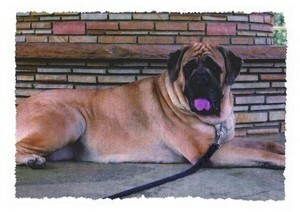 To see another photo of this extraordinary mastiff, please click here. When my husband and I decided we wanted a new dog, I was in my late 40’s and had never owned a pet, even though Alan had grown up with Rottweilers and Dobermans. After doing some research, we decided on a mastiff. When we finally went to pick up our 11-week-old mastiff puppy, it was love at first sight. My Mastiff journey had begun. We decided to name her Fluffy, a name we knew would make people smile right off the bat. It was obvious from the start that Fluffy was definitely going to be my dog. When she was 6 months old, I started taking her to obedience classes once a week. Nobody in class had ever seen a Mastiff before, and the instructor enjoyed the novelty of having such a breed in the class. And Fluffy graduated first in her class! When she was 9 months old, we went to watch a local fun match, and someone suggested I enter Fluffy. What a ridiculous suggestion, I thought. But I entered her, and she won! One instructor noted Fluffy's wonderful temperament and said she would make a great therapy dog. Meanwhile, Fluffy graduated from all her classes in first place and won two more first-place ribbons in Fun matches. She received her Canine Good Citizen® certificate at 10 months. When I received the list of facilities asking for therapy dogs, I noticed that few volunteers were going to any of the hospices in Las Vegas. We signed on with Nathan Adelson Hospice, a facility where many patients live their final days. I wasn't sure how I would handle being around patients who knew they were dying. On our first visit to the Adelson facility, we entered a room where a patient had just died. I was terrified. On seeing Fluffy in the room, the family members started to kiss and hug her in silence while their tears rolled down their cheeks onto her face. They were so touched that I had brought her to them at that moment in their lives. Fluffy was an excellent therapy dog, and it was incredibly gratifying to hear a person whose days were numbered tell us how she had made their day. At age 2, Fluffy weighed 182 pounds and was 33 inches at the shoulder. She could give the patients kisses while they rested in their beds. She was always the conversation piece and the "icebreaker." It used to take us 15 minutes just to get past the nurses station before we saw the first patient. We found out that the nurses needed therapy too! My supervisor asked if I would take Fluffy to Sunrise Children's Hospital Foundation as well, knowing that Fluffy loved kids. The children thought Fluffy was cool. In the cancer ward, I let her lay on their beds and they soon became friends. Nurses said that after our visits, the children slept better at night and didn't require as much pain medication. Fluffy was a wonderful ambassador for her breed. 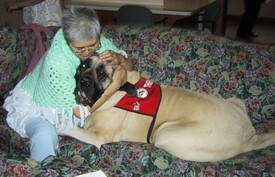 In 2004 Fluffy was awarded the MCOA Wright Service Dog Award at the Tucson Specialty. My Mastiff journey continues now with Desertknight’s Princess Muffy, CGC, TDI, who just passed her TDI and will begin her service work shortly.